Participate in our soundnetwork all over the whole planet ! Where sound producing people worldwide find connection to each other. The crystal sound temple has made it his mission, among other,to interconnect many sound temples worldwide. 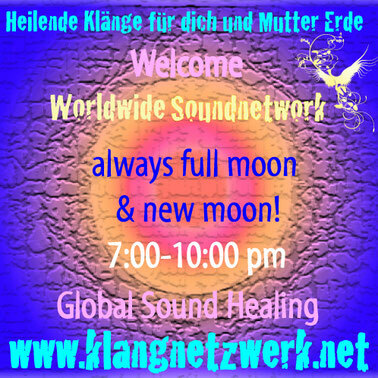 Therefore we launched the worldwide sound network, which might expand and extend more and more now. Our sound network continues to grow. even organize one yourself or simply resonate along at home ! Please share this information, so that we get as many as possible ! 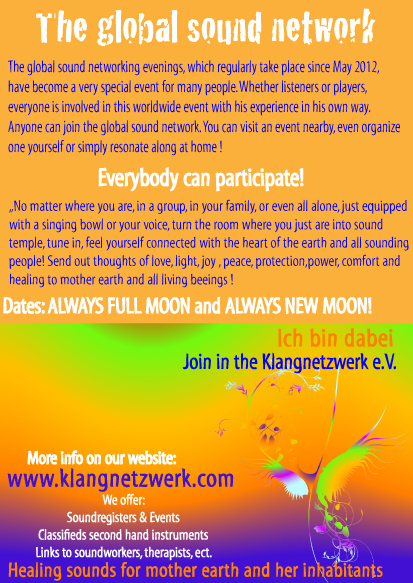 No matter where you are, in a group, in your family, or even all alone, just equipped with a singing bowl or your voice, turn the room where you just are into sound temple, tune in, feel yourself connected with the heart of the earth and all sounding people ! Send out thoughts of love, light, joy , peace, protection,power, comfort and healing to mother earth and all living beeings ! Even when you can't stick to the exact time, the energy will follow your good intention and together we will be much more than the amount of participants ! Please sign to the list with your name and your position, for an overview. global portal of sounds. 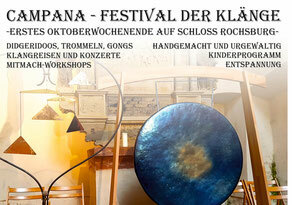 Everthing with sound under one roof ! We are happy that you're in! Dear friends of the sound ! and received messages from the spiritual world. This is a very powerful possibility to send ourself and mother earth energies of peace, harmony, healing, freedom, joy and love. Particularly to crisis areas and people who need help. with her soft vibrations, the elements and the kingdoms of the natural beeings ! 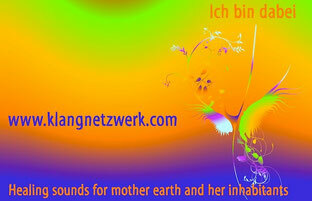 With the sounds, we envince particularly our readiness to vibrate unison with mother earth again. Let's play and sing together with mother earth and the kingdoms of the natural beeings ! life resonances in balance between all areas of existance. Let's do this together once again in 2012 ! I'm looking foreward to all of you who like to take part ! Sounding regards to you all, and thank you in advance for spreading ! Donates from all networkers are thankful appreciated as well, they benefit the expansion of the entire soundtemple project !